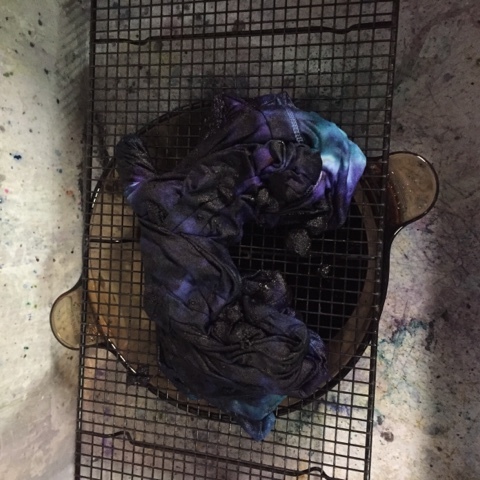 There's a new way to dye. Instead of using hot water you use ice and it's so much fun. I bought a white t-shirt at Target for only $5. Can't beat that. Always wash new clothes before dying to remove any sizing or finishes. You don't have to dry the shirt. As with any dying do this where you don't mind making a mess. I use my utility sink in my laundry room. You need a rack to hold the shirt that the ice can melt through. I used my cookie cooling rack. 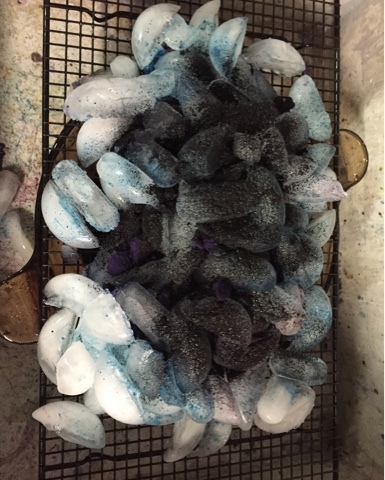 You also need powder dye (2 or 3 colors) and lots of ice. I put my dying pot under the rack to hold it up so water doesn't pool under the shirt. Wet your shirt and scrunch it up. I tried a small spiral twist but don't use rubberbands they'll create hard lines. You're trying a marbling effect. 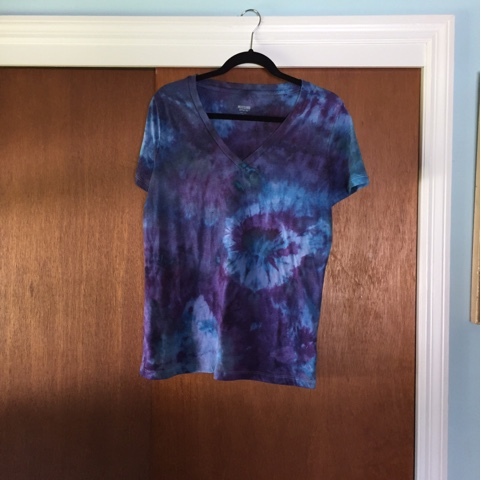 Cover shirt in lots of ice and then sprinkle on the powder dye. Then wait. I left it over night. Once all the ice is melted you're done. Spray color fixative so the color won't fade. Wait 20 minutes or so then rinse with cool water until the water runs clear. Wash shirt by itself or with old towels.